A friend recently loaned me the book Ink Heart which I enjoyed very much. I had seen the movie so I was reluctant to read the book, but I am now looking forward to reading the two sequels. 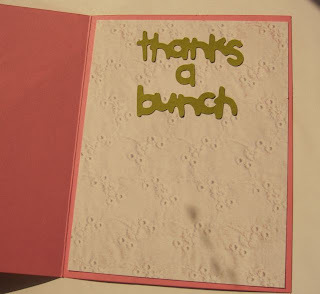 Here is the thank you card I made for her. I used the cartridge Walk in my Garden to cut the flowers, pot, and sentiment inside. 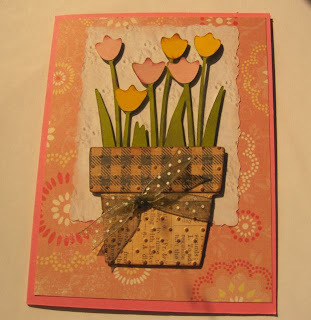 I also used the cuttlebug to emboss the pot with the swiss dot folder and dimensionals to raise the flowers and pot. I am really going to work on my photography skills. There is a shadow slanting through the bottom third of both photos and the color is way off. My apologies - I will do better in the future!! So pretty! I like the flower pot with the ribbon. You should treat yourself to a new camera! !